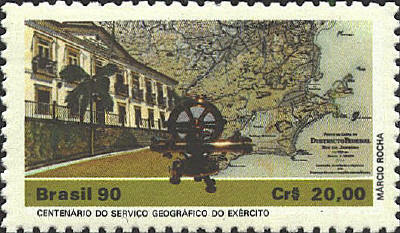 The stamp below commemorates the centenary of the Serviçio do Geograpfico do Exército. The map is identified as Distrito Federal Rio de Janeiro. In 1810 and again in 1823 there were proposals to build a capital city for Brazil in the interior, but it was not until the First Constitution of the Republic was drawn up in 1891 that a specific proposal was included in Article 3 to set aside 14,4000 square kilometers in the Central Plateau for the new city. 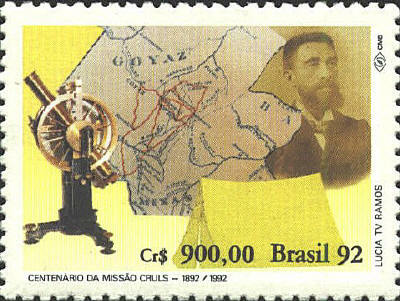 In 1892 the Commissão Exploradora do Planalto Central was created. It was led by the astronomer, Luis Cruls. Two years later the Cruls Quadrilateral was established as the site of the future capital. In 1956 the name Brasilia was proposed, and later that same year construction began on the provisional presidential residency. In 1960 Brasilia was inaugurated, and the Three Powers of the Republic moved to the city. The spellings of place names on the map are not contemporary and it is probable that the map was the work product of Cruls' expedition. The red lines appear to be modern roads and highways that serve Brasilia. The instrument on the left side of the stamp also appears on the next stamp, while the tent points to the hardships Cruls and his mission endured in identifying the site for the Federal District.